An alleged blacklist of state-run organizations’ chiefs is stirring up the political arena, with the main opposition announcing plans to file criminal complaints against former and incumbent officials of Cheong Wa Dae and the Environment Ministry. 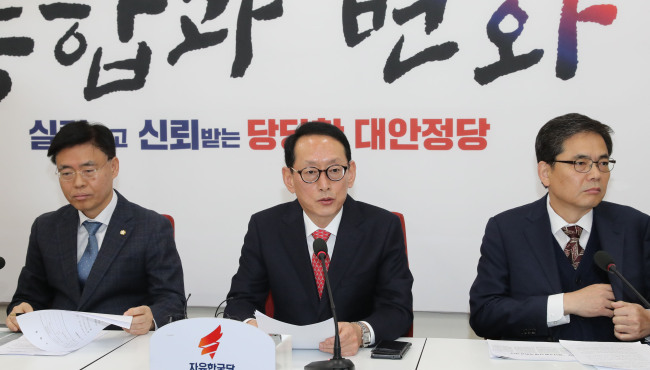 According to the main opposition Liberty Korea Party, the Ministry of Environment compiled intelligence reports on former ministry officials and chiefs of state-run organizations under the ministry. The party has taken issue with the compilation of reports on state-run organizations’ chiefs, claiming this constituted a blacklist of officials appointed during the Park Geun-hye administration, and that they were listed for replacement. The Environment Ministry had initially denied the allegations, but later claimed the list was compiled on the request of Kim Tae-woo, a former Cheong Wa Dae inspector under investigation. While the ministry denies the allegations, and laid the blame on Kim, the Liberty Korea Party accused former Minister of Environment Kim Eun-kyung and other officials of abusing their authority, and the ministry and Cheong Wa Dae of colluding on the matter. In a related development, the internal inspection team of the Supreme Prosecutors’ Office said it would request Kim to be dismissed over allegations of misconduct during his time on Cheong Wa Dae’s special inspection team. Kim, an investigator with the prosecutors’ office, was removed from the Cheong Wa Dae post in November over allegations that he abused his authority and had inappropriate connections with a businessman. In the probe, the inspection team of the Supreme Prosecutors’ Office concluded that allegations against Kim are true and that his actions require heavy penalties. Allegations against Kim include leaking information gained in his official duties; playing golf with a businessman identified by the surname Choi in a manner violating the code of conduct; and attempting to interfere with a police investigation. Choi, who is under investigation for bribery, allegedly requested Kim to manipulate the investigation in his favor. According to the prosecution’s inspectors, Kim had arranged meetings with high-level police officials and attempted to view the investigation log on the case. The probe also revealed that Kim and Choi had shared information regarding government probes since 2012, and that Kim requested Choi’s help in being reassigned to Cheong Wa Dae’s special inspection team last year. The inspection team of the presidential office is staffed by investigators selected from the police and prosecutors’ office. Kim has served on the team three times, in the Lee Myung-bak, Park Geun-hye and Moon Jae-in administrations. Before his latest stint, Kim requested Choi’s help, who then passed on Kim’s information to another civilian. It has not been determined whether Choi’s acquaintance relayed the information to Cheong Wa Dae officials. It has also been revealed that Kim attempted to find employment with the Ministry of Science and ICT. According to the prosecutors’ office, Kim prompted the ministry to establish the post of inspector by contacting high-level ministry officials between November 2017 and August this year, while he was monitoring the ministry. Kim applied for the post, and the ministry had tentatively chosen him for the post, but he was not hired after Cheong Wa Dae intervened. Kim claims that the allegations against him are false and that he was removed from his post unfairly because he gathered information about those with connections to the administration, including Korean Ambassador to Russia Woo Yoon-keun. In an intelligence report, Kim claimed that Woo had taken bribes from a businessman.